Obviously, the first thing in your ebook should be the front cover. That is, an html file containing just the cover image. Most likely this will be exactly the same as the print book cover. (See a forthcoming post on creating an html cover for more about this. To be linked here when published.) The rest of the book would naturally be identical in sequence to the print book. An e-book ONLY publication would logically be in the same sequence as a print book would normally be. However there are some things to bear in mind. This post covers the usual sequence of the material in a book and some of the peculiarities of design which the e-book format requires. The first and obvious difference is that a print book contains pages with two sides. The right-hand (odd-numbered) page is referred to in the publishing industry as a ‘recto’ page and the back of this page is called the ‘verso’. This distinction does not apply in an e-book. By convention, certain parts of a print book always start on a recto and may have to be preceeded by a blank verso page if need be. This convention can and should be ignored in an e-book. Just put each section of the text into a fresh chapter (html file). Reviews or ‘Praise for the book’ are a good idea, as this will help sell your e-book. A brief author biography would also work, or else a list of previous books the author has published. IF there is nothing suitable to put between the two title pages, THEN it is probably best to omit the half-title entirely. Half-Title: the main title of the book and nothing else. For consistency of presentation I make a copy of the Main Title page, delete all but the title and then save it as the half-title. This way the styling of the title line is the same. Half-Title Verso: use this for an author biography and/or photograph, reviews or list of other books published (by the author or even by the same publisher). Print books would sometimes have a frontispiece here. If you have nothing to put in this place, omit the half-title as well, for the reasons given above. Full-Title:The full title of the book including any sub-title, the volume number (if any) the author’s name and the publisher’s imprint (name and logo). Full-Title Verso: The copyright declarations are always printed on the back (verso) of the Full-Title page (the fine details are probably best gone through in a separate post, but note that this is in addition to the information stored in the metadata section of the e-book). Contents: In an e-book this will be the html table of contents, containing hyperlinks to each of the parts, chapters and/or sections of chapters which follow the table of contents in the e-book. An exception to this is that a frontispiece, if there is one, is usually included in the table of contents, but the half-title, title page, title page verso, etc. which preceed the table of contents would NOT normally be included in it. As there are no page numbers as such in an e-book the entries in the html table of contents will be just hyperlinks to each chapter. There is some disagreement as to where to place the table of contents. Oxford style says the table of contents should follow the Preface. Chicago says to put it here, following ‘a dedication or epigraph if there is one’. I have found the table of contents most often immediately after the title page verso in printed books and so I would recommend putting it here, following Chicago, rather than Oxford, in this case. This will also make it possible to include the Foreword and Preface in the table of contents, which would seem appropriate. There is quite a bit to how to generate and style the html table of contents, and so I will deal with this in separate posts. Another table of contents, the logical table of contents is also required, see this post to get started making the logical table of contents and this post for a complete reference to the syntax of the logical table of contents. See also some further comments below. Introduction: Following Chicago Style a lengthy introduction by someone other than the author could be placed after the acknowledgements, although if fairly brief it could be considered to be a Foreword and inserted in the usual place, after the Contents (see above). The logic of this is that you would normally have EITHER a foreword OR an introduction but NOT BOTH. List of illustrations, etc. : again, these would obviously be hyperlinked to the relevant illustrations. Following Oxford style, the entry in the table of contents would usually be called ‘List of Illustrations’, whereas the actual section in the book would more logically be called just ‘Illustrations’. List of tables: hyperlinked to the relevant places where the tables are to be found. As for the previous item, this section would be called ‘List of Tables’ in the table of Contents and ‘Tables’ in the text. List of Abbreviations: as for other Lists, call it ‘Abbreviations’ in the text and ‘List of Abbreviations’ in the Table of Contents. List of Contributors: if there are many authors it is usual to provide brief biographies. Chicago Style would have the preferred location for this section immediately before the index. Hart says to put it here, after any List of Abbreviations. This would seem to be the main difference between Oxford and Chicago Style regarding the placement of items within a book. Although to be fair, Hart does say that ‘the more detailed and discursive the entries, the more appropriate they should go in the end matter’, whilst not saying exactly where. It should also be noted that both Hart and Chicago say to style the author names in the natural order, beginning with the author’s first name, BUT to sequence the entries in a list of contributors in alphabetical SURNAME order. The previous comments about naming apply to this section as well: call it ‘List of Contributors’ in the table of contents and print: ‘Contributors’ at the top of the first page of this section. Obviously you might not have all these sections in your preliminary matter, but this is the customary sequence in which these parts of the book appear. Each section of the preliminary matter needs a ‘chapter’ (i.e. an html file) to itself in the e-book. Following the preliminary matter you will have the chapters of the e-book, each as a separate html file. The customary sequence of the main text is discussed below. Second Half-Title: The Chicago Manual of Style suggests adding a second half-title, identical with the first one, at the start of the main text in books where there is a lot of preliminary matter, and this sounds like a good idea to me. Introduction: If there is an introduction by the author, this would usually be the first part of the main text. Chapters and Parts: The remainder of the main text consists of a number of chapters, possibly grouped together into parts, such as Part One, Part Two, etc. or some more descriptive part titles. Parts of a book should normally contain more than one chapter, except where the part contains ONE introductory or concluding chapter. A part would, in a print book, have a title page to itself. It is probably best to do the same in your e-book, making a ‘chapter’ for each of the title pages for the parts. In a print book the title page for each part would normally be on a facing page (recto, right hand or odd-numbered) but, in an e-book this has no significance. Obviously there is no need for a blank verso page following the part title, as there would be in a print book. In fact blank pages are pretty much to be avoided anywhere in an e-book! Parts would usually have Roman numbers. Chapter numbers, if any, would be in Arabic numberals or spelled out. You may use the word ‘Chapter’ in the contents but, if you do, then the title of the chapter in the main text should also use the word ‘Chapter’. SubSections/Headings: Depending on the nature of the book, you might consider subheadings within a chapter to be appropriate instead of lots of short chapters. And in complex, academic works, you might have various levels of headings, subheadings and even sub-sub-headings, but probably no more than three levels of subheadings, or else it will get complicated. Subheadings or sections within chapters might also be numbered, but that would again be dependent on the kind of book you were publishing. And beware of referring back to the subheading (or for that matter heading) text using a pronoun in the first line which follows it. For example: do NOT have a subheading such as: ‘1.3 Dogs’ followed by ‘These are extremely loyal.’ Best to restate the title by for example following a heading such as: ‘6.9 Cats’ with something like: ‘Cats tend to please themselves’. Conclusion: summing up your work’s findings and putting them into context. Epilogue (sometimes called an Author’s Note): this is nothing more than a short concluding comment on the text written by the author. Afterword: much the same as an Epilogue, but typically written by someone other than the author. There would normally be EITHER an epilogue OR an afterword but NOT BOTH. Appendix: or even multiple appendices, each in a separate chapter. Chronology: Following Chicago Style a chronology if any would go next. Oxford is silent about where to put a chronology. If you have one in your e-book, maybe it would best to follow Chicago Style and put it here. End Notes: It would be best practice for any note reference in the chapter to consist of a hyperlink to the text of the note at the end. It is very time consuming to do, but would lead to a greatly enhanced reader experience. You might want a ‘return’ link at the end of each note to return the reader to the place they were reading in the text when they chose to view the note, but it is probably best to resist the temptation and leave it to the reader to use the ‘go back’ button on their e-reader. Because there are no page boundaries in an e-book, the concept of a footnote would seem irrelevant, as there are no actual pages as such to place the notes at the foot of. In an ebook I would have thought ALL notes would need to be endnotes. Whether they go at the end of a chapter or at the end of the book is a matter of editorial choice. There are some styling issues around notes and constructing the links can get complicated, so I will devote a number of posts to how to do notes and link them here when they are published. Bibliography: If entries in the bibliography are referenced in the notes, or for that matter in the main text, then making the link into a hyperlink (from the endnote to the bibliography) would seem to be recommended. Again, this is getting complicated, and the design of the links in such a book would need careful thought. I will devote several posts to creating, styling and linking the bibliography as well. List of Contributors: As noted above in the section on the preliminary matter, Hart would have short biographical notes about the contributors to a multi-author book fall in the preliminary matter, Chicago says such a list of contributors should go here, immediately before the Index. Hart suggests longer and more discursive contributor biographies are better in the end-matter. See the comments above regarding naming this section in the table of contents and in the book text. Index: An index would have to be designed rather differently in an e-book, since there are no page numbers as such. If an item in the index appears only once in the main text, I would have thought making that item in the index into a hyperlink to the relevant place in the book was a good idea. 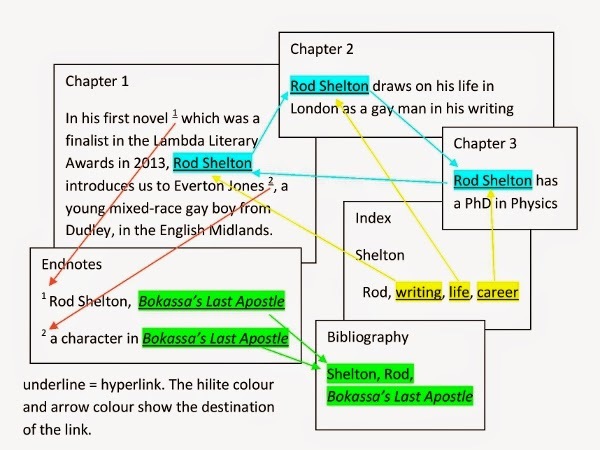 If however an entry in the index is to point to two or more locations within the e-book then I would have thought something like ‘chapter 2’ and ‘chapter 4’ or even something more informative (see the diagram below) could be listed after the entry and made into hyperlinks to the relevant places in the text in those chapters. I would not have thought return links in the main text back to the index were necessary. Most likely the reader will want to look something up in the index and then jump to the main text, not the other way around. In an academic book you could possibly make the indexed words in the main text into links to the next instance of the indexed word. I will devote several posts to the creation, styling and linking of an index in due course. Colophon: if the book has been specially produced, according to Chicago Style, there might be a special inscription on the last page ‘including the facts of production’. This probably won’t apply to most e-books. I always end e-books with a copy of the back cover of the print book. Only with the substitution of the barcode and ISBN appropriate to the ebook rather than the print book. If you are uploading files for the Apple Store then be warned that they will be rejected if you put a price on the back cover. And as the prices of e-books tend to be varied quite often, this would seem not to be a good idea. My next post will go into the wording of the copyright declarations on the title page verso in greater detail, as this is an important issue.